Do you remember when the most popular method of DNA amplification involved multiple hybridizations, followed by single or 2-primer extension and ligation steps? DNA amplification was a long and tedious process, and if people followed the saying “if it ain’t broke, don’t fix it” the world would certainly be in a different place today. Without rapid PCR assays, it could take several months for medical test results, innocent people would continue to overcrowd prisons, and less research will be achieved but more interns hired (someone needs to perform all those hybridizations). Fortunately, on a lonely stretch of highway, Kary Mullis conceived the idea of the PCR process. 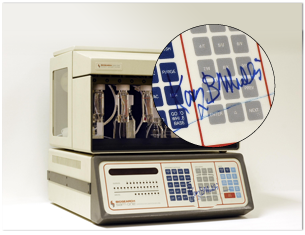 Then, armed with an early Biosearch Sam I automated DNA synthesizer and an abundance of oligos, Mullis was able to significantly advance the PCR process by following the scientific approach of trial, error and revision, based on knowledge of chemical and molecular interactions. Suffice it to say, without the invention of the PCR process, supplemented by the contributions of scientists and engineers since the early 1980s, we would not be benefitting globally from the useful and diverse applications of PCR. In celebration of 30 years of PCR we are inviting everyone to a free webinar hosted by The Scientist. Kary Mullis, inventor of the PCR process, will be joined by Stephen Bustin, a real-time qPCR expert, and Reginald Beer, a digital PCR trailblazer, in sharing the life of PCR: Past, Present and Future. The live webinar will take place Wednesday, September 11 from 2:30 – 4:00 PM Eastern Time. Before continuing on with the rest of your day, why not share a moment about how the PCR process impacts your life? Feel free to post in the comments section your experiences with PCR, from the humorous to the aggravating, or tell us why you are interested in this webinar.